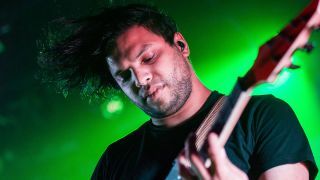 Periphery’s Misha Mansoor has been confirmed for this year’s UK Guitar Show. The event will take place at London’s Olympia on September 29 & 30 and is brought to you by the organisers of the London Drum Show and the London Bass Guitar Show and is run in association with with MusicRadar, Guitarist, Total Guitar, Guitar Techniques and Louder. Last month, details of the acoustic workshops and tuition clinics were announced, revealing that YouTube sensation Justin Sandercoe will be in attendance, while Guitar Techniques magazine’s long standing classical tutor Bridget Mermikides, along with Jon Bishop and Steve Allsworth will also be there. Now fans will be able to get up close and personal to Mansoor – who won the 2014 Metal Hammer Golden Gods Dimebag Darrell Shredder award – on the main stage on the 29th between 5.00-5.45pm.